If you have a big family and/or lots of friends, plain and simple you are going to need a big boat to make sure no one gets left behind or better yet so that a day on the water doesn’t turn into a bunch of sardines crammed into a can. Usually however as boat size goes up, usually does price, leaving those who are on a budget to either sacrifice either size or quality to find a boat to fit their needs. Princecraft saw this need and for 2017 has addressed it by expanding their Vectra line to 25-feet and we got to test the Vectra 25 LT. 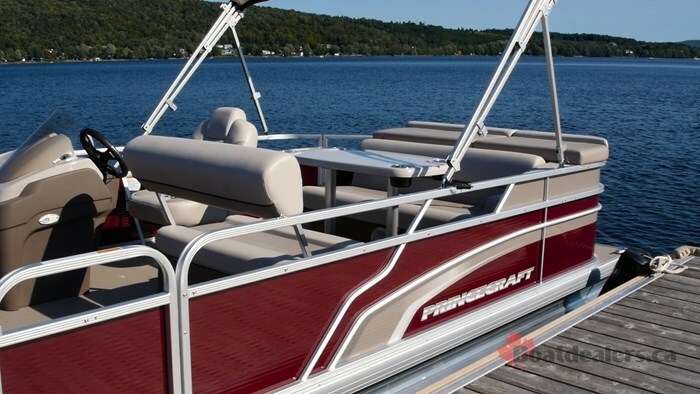 Starting at 17-feet and now going up to 25-feet, Princecraft’s Vectra Series is the affordable family fun series that fits your budget without having to compromise the most important feature of all: quality. 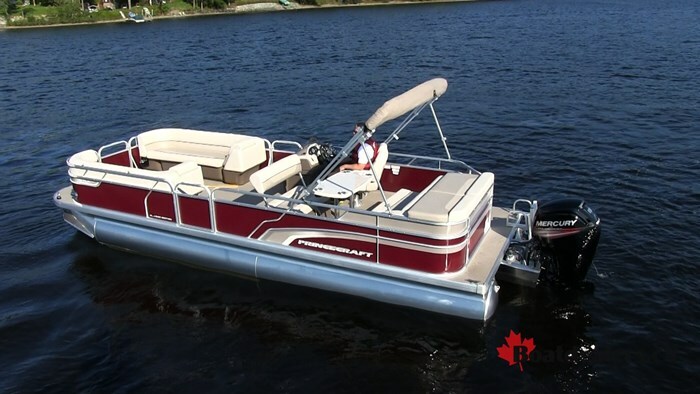 As the last pontoon boat builder in Canada, one of the things that has kept Princecraft so successful is their pride. Everyone at the company is proud of every boat they make, so you know that whether you’re buying one of their luxury boats, or their affordable models, you’re going to get a boat that is built with pride. With an overall length of 25-feet, 8-inches, the 25 LT has the room a big crew would need with plenty of seating and storage for all the gear they would bring along. The “LT” in the model designation stands for “Lounger Table” which is the center point of this boat. 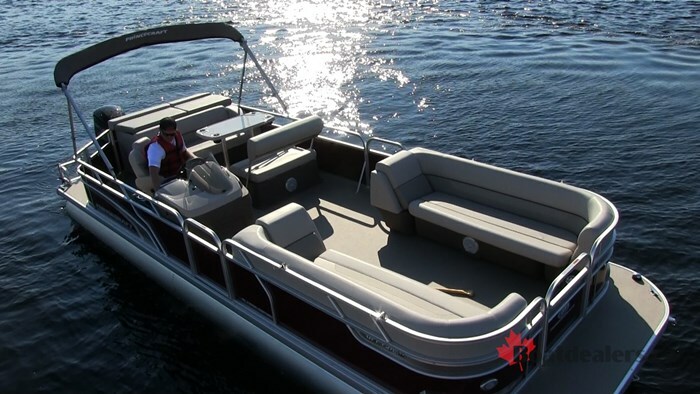 Instead of having a traditional L group lounge mid ship, like most pontoons do, the LT features a large forward facing bench seat that has a removable table in front of it. Forward of the table is a second seat that converts. The backrest can be in the forward position so everyone can be seated around the table, but then shift it back and now you have a forward facing bench seat for cruising and relaxing. Both seats are quite simple, resting on rotocast bases and having hinging storage to allow easy access to just toss gear underneath. Under the bench seat you will find the large storage bin, but under the forward seat, you will find a cooler built into the base that drains out. 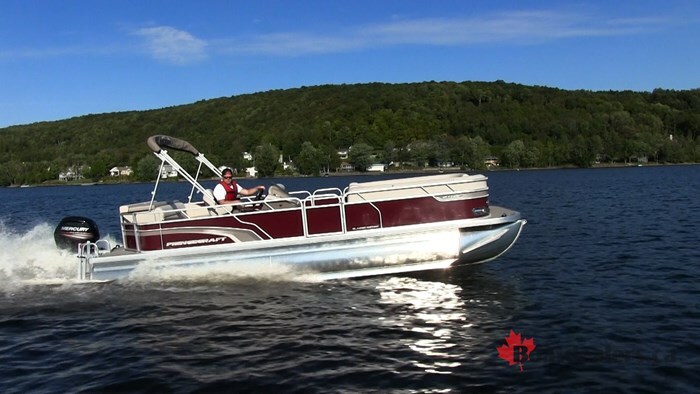 Coolers on a pontoon are an absolute must and it’s nice that while you’ll be saving money, you’re still getting the features you need. What I also like about the LT is the position of this lounge. It’s right next to the helm, keeping the Captain in on the party, or if it’s just a couple out for an evening cruise they’re not sitting far apart from each other like with some layouts. It’s also one of the best ways to get the most out of the space you have. The helm on the 25 LT is simple and functional, built out of Rotocast rather than fiberglass. This is where you will save some money, but also better yet you’re going to save some weight as well, which will lead to better performance. The helm comes with a Speedo and Volt meter standard with all of your rocker switches to the right of the tilting steering wheel. There is a full premium Jensen stereo complete with 4, 6.5-inch speakers throughout the boat, along with LED’s under the helm and a premium, high back captain’s chair. Something that I LOVE about this boat is that it features not only the usual port side gate, but also it brings back the starboard gate as well, as a standard feature. Large pontoons can be tricky to dock if you’re new to them, and only being able to dock on one side can become a pain. But with the starboard gate you can easily dock on both sides of the boat, but better yet you have easy access as well for those less mobile. Forward in the bow area you are going to find a simple layout of two, facing bench seats, both with forward facing chaise lounges for when there’s less people on board and you’re able to kick back and relax. Not only that, but there is storage found in the back of those chaise lounges, a feature usually found on higher end boats. 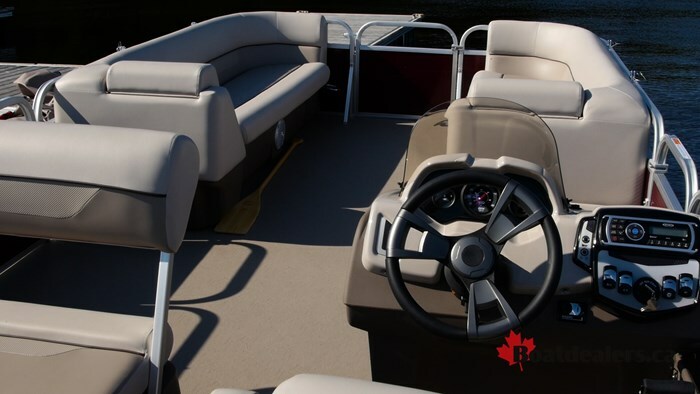 Naturally there is more storage under the bench seats as they hinge forward giving you full access and enough room to even stow your mooring cover. Rounding out the interior layout is a large sunpad found at the stern of the boat, behind the table bench seat. This is a great place to catch some rays and is even large enough to fully lay down and take a nap. It lifts up into two-different compartments. The first is like a large dock box and is big enough to stow large items like deflated tubes and water toys. The second is on the port side and smaller than the first, but has a secondary compartment inside it, that would be great for items you don’t need readily available. 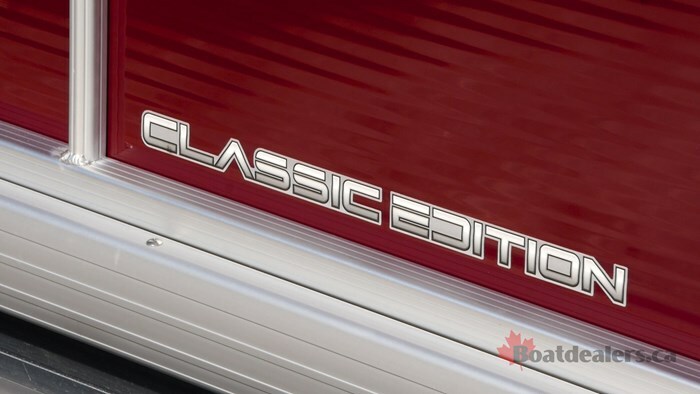 The aforementioned LED helm lighting and deluxe captain’s chair are part of the Classic Edition Package that this 25 LT features. 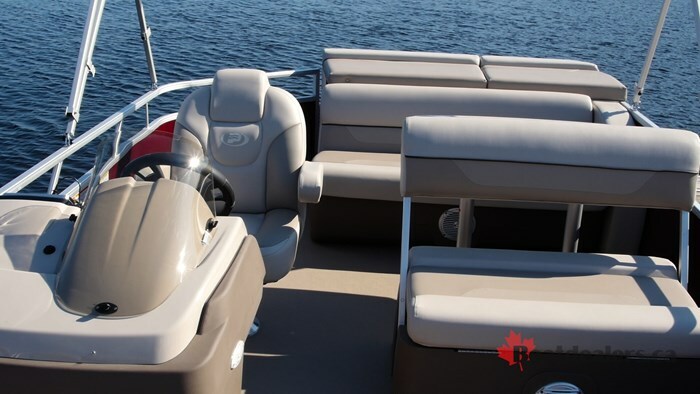 Other elements of the package include the monochrome upholstery accents along with the graphics found on the exterior of the boat. It’s a sharp boat dockside with distinct curb appeal. Princecraft does a great job with the use of their D-Railings to create styling and accent it tastefully with vinyl graphics. Corrugated fence paneling is used not only because it is stronger, but it also looks sharper than the regular flat paneling found on competitors value boats. Now when it comes to running performance of a boat like this you have to walk a fine line. Adding things like third pontoons and big horsepower are going to up the price tag. But at the same time, you don’t want to have a 25-foot floating dock that won’t take you anywhere. Princecraft has found that balance for the Vectra 25 LT with their Speed Configuration. Configured for twin log performance, the Speed Package features full length strakes on the inside of the pontoons, as well as exterior strakes that run down the front half of the pontoons to help with lift, along with a full deck underskin shield to prevent drag from the cross-members. That, combined with the Mercury 115-hp outboard and we had an impressive performing family fun package, while remaining at a great price. With two on board, we hit a top speed of 31 mph! A very impressive number and turns were quite nimble relative to the size of this package. 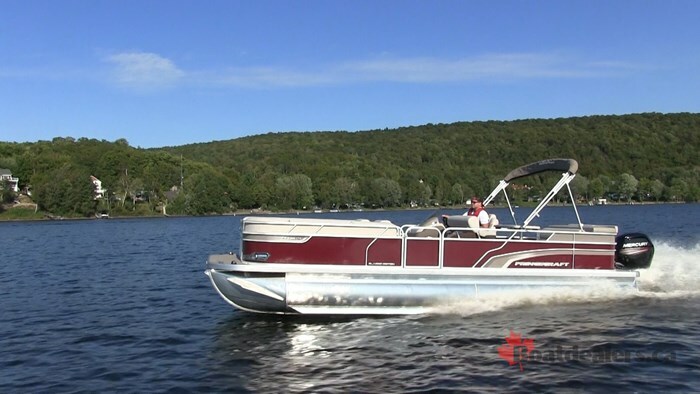 It would make for a great family fun boat that will allow you to get to the far end of your lake and back again without taking the entire day. Naturally when you add people it is going to reduce the top end speed of the Vectra 25 LT, but they’re going to be so engrossed in conversation and relaxed that they’re not going to care how fast they’re going. They’re just going to be happy they’re out on the water, and really no matter what your budget is, that’s what boating is all about.